W. W. Norton & Company, 9780393609264, 352pp. There, in a lush landscape of fire-petaled immortelle trees and vast plantations of coffee and cocoa, where the three hills along the southern coast act as guardians against hurricanes, Krystal A. Sital grew up idolizing her grandfather, a wealthy Hindu landowner. Years later, to escape crime and economic stagnation on the island, the family resettled in New Jersey, where Krystal's mother works as a nanny, and the warmth of Trinidad seems a pretty yet distant memory. But when her grandfather lapses into a coma after a fall at home, the women he has terrorized for decades begin to speak, and a brutal past comes to light. In the lyrical patois of her mother and grandmother, Krystal learns the long-held secrets of their family's past, and what it took for her foremothers to survive and find strength in themselves. The relief of sharing their stories draws the three women closer, the music of their voices and care for one another easing the pain of memory. Violence, a rigid ethnic and racial caste system, and a tolerance of domestic abuse--the harsh legacies of plantation slavery--permeate the history of Trinidad. 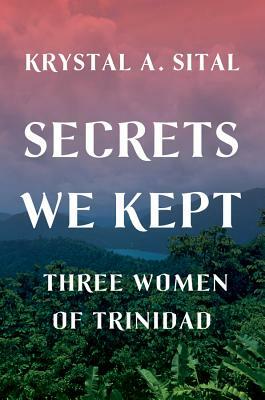 On the island's plantations, in its growing cities, and in the family's new home in America, Secrets We Kept tells a story of ambition and cruelty, endurance and love, and most of all, the bonds among women and between generations that help them find peace with the past.